N-Line Technologies takes a probing look at how Microsoft Office 365 addresses the cyber-security concerns of small business owners like Bryce McDonald, whose company, Day1 Wake, delivers wakesurf boards to customers across the country. Bryce knows that, wherever he goes, Office 365 multi-layer security is working 24/7 to safeguard the integrity of his business data. Contact us–we’d love to show you how Office 365 can do the same for businesses in Midland, Odessa, and the Permian Basin. Small business owners who use technology have an edge. I found this great list of tips. These small business technology ideas will get you started on the path to productivity. Office 365 can provide many ways to implement these ideas and we can help you with that. Call us today at 432-279-0671 and let us help become more productive. N-Line Technologies takes a deeper look at how Microsoft Office 365 helps Bryce McDonald, a solo entrepreneur who runs DAY 1 Wake, a wakesurf board making business, scale his home-based business out to the world. Office 365 gives Bryce a new level of freedom that he didn’t have previously because the cloud-based app lets him access, edit, and share documents from anywhere on any of his devices. Want this same level of flexibility? Sign up for Office 365 today. Any organization that wants to achieve something that matters can’t do it alone. In this video, Microsoft describes how it’s reinventing productivity around people. Taking collaboration fueled by intelligence and the flexibility to work with anyone, anywhere to a whole new level. It’s a premium connected experience grounded in trust, not a collection of products. That’s the core Microsoft Office 365 ambition, helping people focus their energy on purpose rather than process, allowing them to achieve what matters most. In this video N-Line Technologies takes a look at how Microsoft Office 365 helps solo entrepreneur Bryce McDonald tap into the power of the cloud to manage the vendor and customer relationships that help him scale his home-based wakesurf board making business, DAY 1 Wake, out to the world – without sacrificing the thing that matters to him most, his family. Contact us today to find out how we can help you do the same. We love this new short clip from Microsoft. It highlights the incredible amount of secure data storage each license of Microsoft Office 365 provides through OneDrive for Business. One Terabyte to be exact! It’s not just the amount of data storage that matters, but also its safety. With Office 365, small businesses don’t need to worry about losing precious time, or information, because everything that you need most is backed up and secure. Contact us today to find out how we can help you do the same! In this video N-Line Computers takes a look at how Microsoft Office 365 helps small business owner Scott Naucler and his three employees work better together – giving him time to pursue his passion for the wind, at work and in life. Contact us today to find out how we can help you do the same. 3 Ways Office 365 Takes the Work out of Working Together. 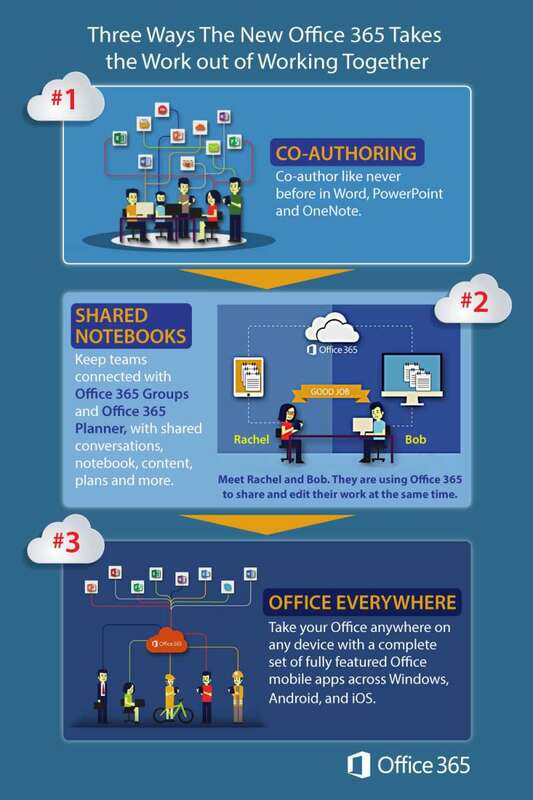 Here is a nice infographic on how Office 365 lets you collaborate easily with your coworkers. Office 365 is much more than just Word, Excel, and email. Its real power is in the ability to share and collaborate on documents and projects with your team. Cloud technology has created a revolution in small business, changing the way you store, share and backup files. While ‘the cloud’ is often hard to understand because it’s neither in the sky or in a single location, there’s no arguing that it’s driving growth across the board. Storage concerns are a thing of the past as small businesses like yours embrace the flexibility, cost savings, and protections of cloud solutions. We’ve done the research for you and identified 5 ways small business in particular benefits from making the move. Budget is always a limiting factor for businesses, many of which are further constrained by pressure from higher up. Some regard investing in cloud solutions as a large expense that can be put off indefinitely. In most cases though, making the switch to cloud storage costs a fraction of the price. Compared to maintaining and powering servers, scaling to keep up, and repairing in emergencies, cloud storage offers extraordinary savings. With one decision, you get access to high-end infrastructure and dedicated support, plus a healthier bottom line. Cloud solutions were specifically created to meet your needs, which means you only pay for what you use. Costs remain capped while the benefits continue to rise, a clear advantage for the budget-conscious business. A lot of people like having their data where they can see it. But that’s not always the safest option. Natural disasters seem more frequent than ever, break-ins are a worry, and employees are always losing laptops and phones, or have them stolen. More often though, someone simply makes a mistake and deletes important files, or accidentally infects the system with malware. Cloud storage mitigates every single one of these risks, with storage in ultra-secure locations, protected against disasters, and committed to robust backup systems. In recent times particularly, we’ve seen many small businesses survive ransomware attacks purely because their critical data was secure in the cloud with clean backups available. We know medical businesses and services need to follow certain regulations when it comes to patient data. This includes security as well as data integrity, plus backups and auditing. Many cloud providers acknowledged this need early on and made sure to offer compliance guarantees. They, therefore, keep abreast of changing regulations, often implementing new requirements before you’ve even heard about them. With cloud storage systems, you essentially slash your compliance workload and let your provider do the worrying. One of the key benefits of cloud storage is your ability to collaborate remotely. In the past, this would have involved multiple file copies that need to be merged back together, often confusing employees as to which is the ‘right’ file. With cloud storage, your staff can work on the same file, using the same interface and real-time updates. Even having different versions of software is no longer an issue. Employees can work on a file in the office and then securely access the same file from their smartphone, laptop or other location, without needing to buy additional software or worry about version corruption. Sharing and collaborating becomes easier, more desirable and more secure, which helps puts your business firmly on track to reach goals in record time. One of the biggest concerns we hear is that it will be too disruptive to migrate to cloud solutions all at once. That’s okay. We don’t have to do it all in one day, we can migrate it in parts. For example, you can move your email to the cloud, or just remote file storage. As your various servers and systems age out or need repair, we can help you move each to the cloud, which means your downtime is minimal to non-existent. You can also actively choose a hybrid approach to keep your legacy applications, with no pressure to move them to the cloud. Our technicians can help ensure smooth integration across your entire business, making sure all your systems work seamlessly together, whether in-house or in the cloud.